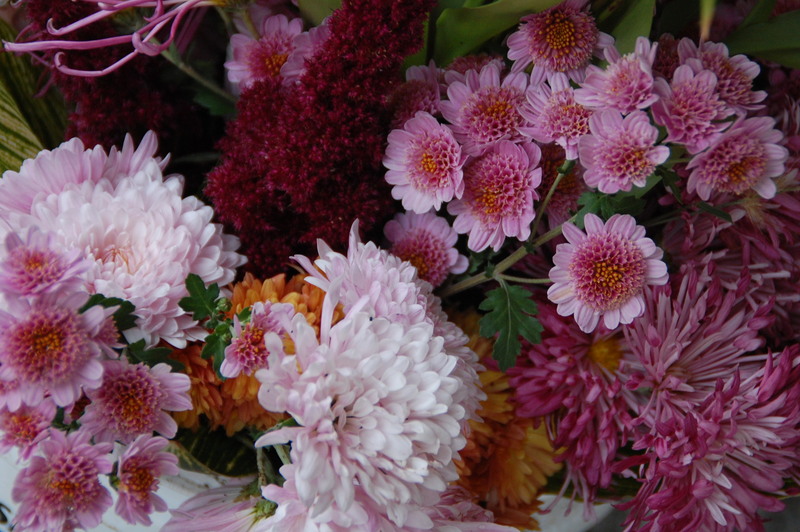 By November most of us are retiring from the garden, but the Chrysanthemums aren’t! They burst into bloom, defying even the occasional hurricane-force winds to add color to our gardens. There are many chrysanthemums that are reliably hardy in our growing zone, and some are reliable spreaders too — we often have these at our annual plant sale in May. 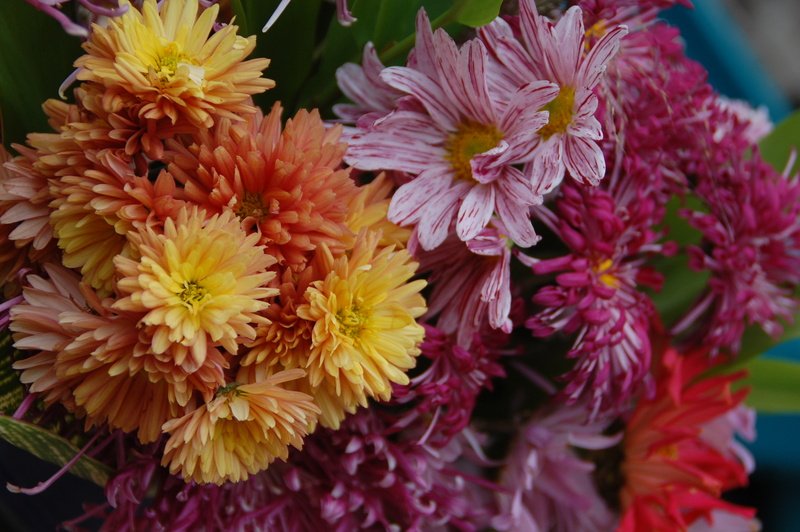 Mums will grow very tall over the course of the summer unless they are pinched religiously until July 4th, when they begin to set buds to bloom. On the other hand, longer stems make for better bouquets. And bouquets they do make — dozens of them, which look fabulous next to your Thanksgiving dinner and those of your closest friends and neighbors. Chrysanthemums like full sun and detest wet feet in the winter, so keep them away from your downspouts and low-lying areas. 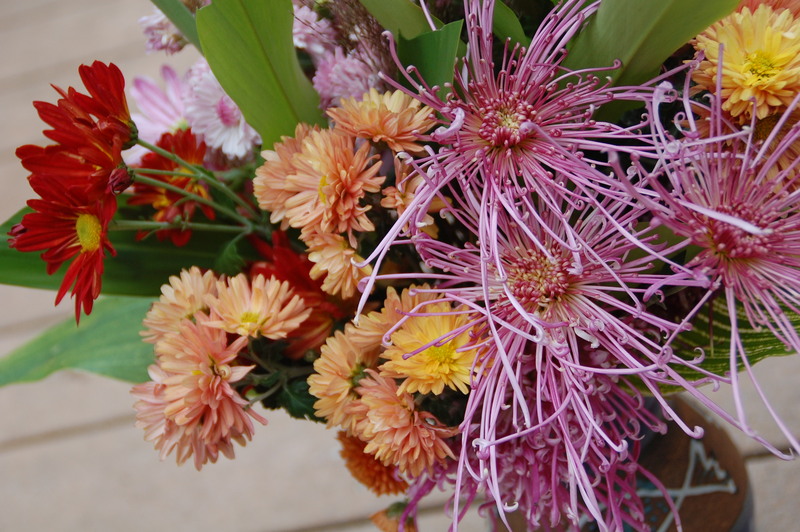 If you’d like to learn how to make bouquets and centerpieces, join us at our November meeting, the first Tuesday of the month. The Garden Club provides floral foam and flower food, and Members and guests provide a dish for their arrangement and cuttings of foliage, flowers, seed heads, and berries from their gardens. Each person goes home with a beautiful arrangement. Each one is so different! We all have a great time. It’s time to harvest all those green tomatoes. Dip them in flour & herbs, then egg, then breadcrumbs, and fry in butter for a delicious southern treat: fried green tomatoes. It’s also the time to put out row covers, if you have lettuces or collards you’ve started for your winter crop. A wooden box with a patio door or old window frame on top or even a simple frame of plastic pipe and clear plastic can keep plants a few degrees warmer overnight, leading to a few more weeks of growth and harvest. Stay warm while you gobble gobble!